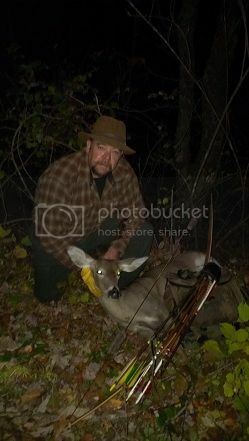 Took this nice Doe on my farm with my 66" 64# at my draw,Mohawk Longbow, POC shaft with a Bear Greenie. She came in to my left about 6:30 one evening made a big circle about 40 yards out in front of me ending up about 18 yards to my right side, slightly quartering away. She turned her head, I came to full draw released and the wooden shaft and Bear head clipped the liver and a lung. She ran about 50 or 60 yards before I heard her crash. The Ol' Bear head left an amazing blood trail. I sure am loving this Mohawk. congrats! and i like the clothing choice!